The last time I visited a royal palace was the Buckingham palace in London in the summer of 2010. Cut to present, in my road trip to Gujarat, I saw the magnificent Laxmi Vilas Palace in Vadodara that (might I say) is as much royal as the Buckingham Palace. The Laxmi Vilas Palace is the home of the Royal Gaekwad family who were once the rulers of the princely state of Baroda right until Indian independence. Maharaja Sayajirao Gaekwad III, a futuristic ruler had initiated the work on this majestic palace in 1878. The structure was completed in 1890, 12 years later and is named after Sayajirao Gaekwad’s third wife, Rani Laxmibai from Thanjore. Laxmi Vilas Palace was one of the costliest palaces of its time. It is, today, considered one of the largest private resident homes in India. Maharaja Ranjitsinh, great grandson of Sayajirao Gaekwad continues to live in the Laxmi Vilas Palace until this day along with other members of the royal family. Some of the sections of the palace which hold historic value have been kept open to visitors under the discretion of the royal family. We arrived at the Laxmi Vilas Palace, clueless of what to expect since most palaces in India are either turned into exotic hotels, government restricted property or even worse, dilapidated. The visit however, was none of the three. Laxmi Vilas Palace is one of the most interesting tourist attractions in India with an architectural structure that was meticulously designed to match the stature of the royal Gaekwad family. The Sunken garden and the Peacocks Urn mark a great start to the tour and both sights are extremely pretty. It is here that visitors get a panoramic shot of the Laxmi Vilas Palace. 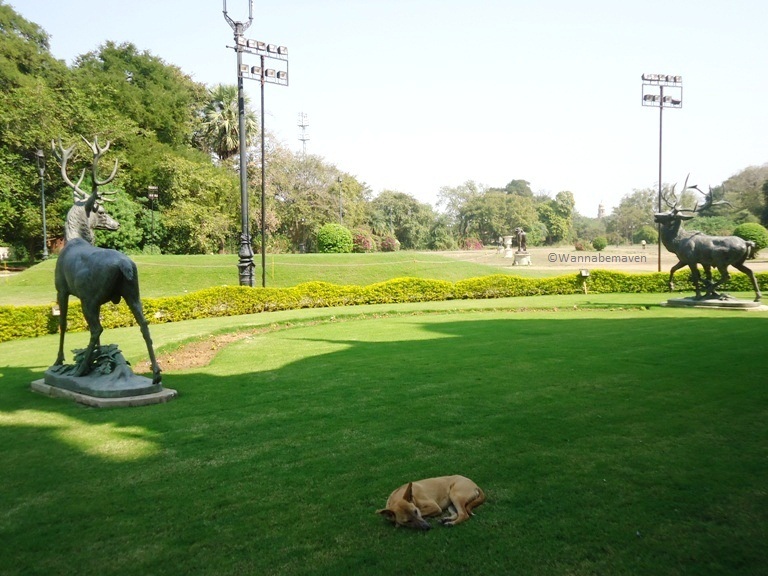 The sunken garden has a championship golf course also known as Baroda golf course that is open to members. A small section of the garden is today leased for weddings, parties and corporate events. The room of Royal Armoury boasts of weapons used by the Gaekwad family themselves. It also displays weapons used by Guru Gobind Singh and rulers such as Aurangzeb and Shivaji Maharaj. The Coronation hall is a simple room with great significance since Maharaja Pratapsinh, Maharaja Fatehsingh and Maharaja Ranjitsinh have all been crowned here. Barring the exclusive mythological paintings by artist Raja Ravi Varma, the room is minimalistic with a plain white cushion while attendees sat on the floor. A very informative audio guide facility is included in your visit. In between explanations, there is a brief monologue of Maharaja Pratapsinh on his experience of being brought up in the palace. A candid revelation has him speak about how it was sometimes annoying that trivial stuff like evening tea would take half an hour to arrive since the palace was so huge. Maharani Jamnabai had adopted Maharaja Sayajirao Gaekwad III after her husband Maharaja Khanderao’s death so as to replace the empty throne. Architect Charles Mant who designed the Laxmi Vilas Palace killed himself because he thought the design of the palace was over ambitious and that the structure would not last. The palace has a 300 ft tower which was meant to be a clock tower but the idea was not implemented since the constant ticking would be a disturbance for the residents. Instead, a lamp was installed that would light up bright red to indicate the king was in residence. This practice is followed even today and additionally, a saffron flag is hosted on the main entrance gate of the palace to signal to the people of Baroda that the king is in residence. The gardens of Laxmi Vilas Palace were designed by renowned botanist Sir William Goldring who designed the famous Kew Botanical Gardens in London. Laxmi Vilas Palace has the maximum number of stained glass ever used in a palace. 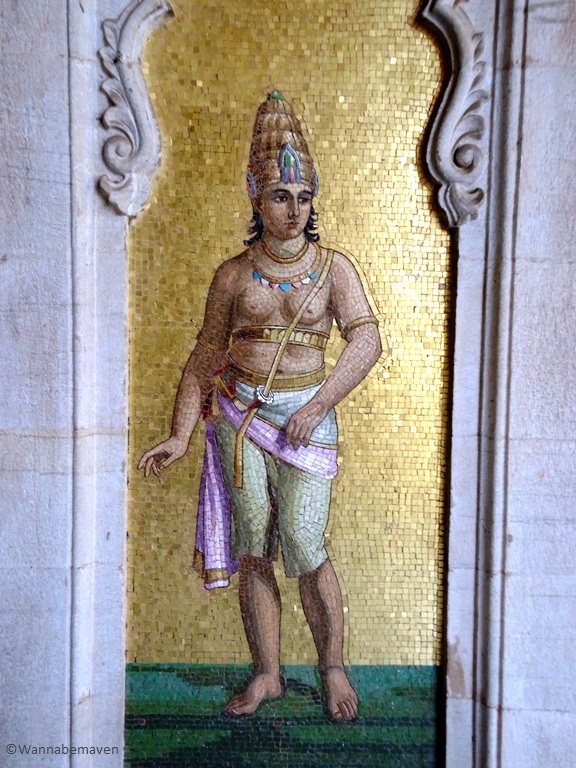 The palace has 170 rooms in all but was originally built for only 2 people – The Maharaja and the Maharani. 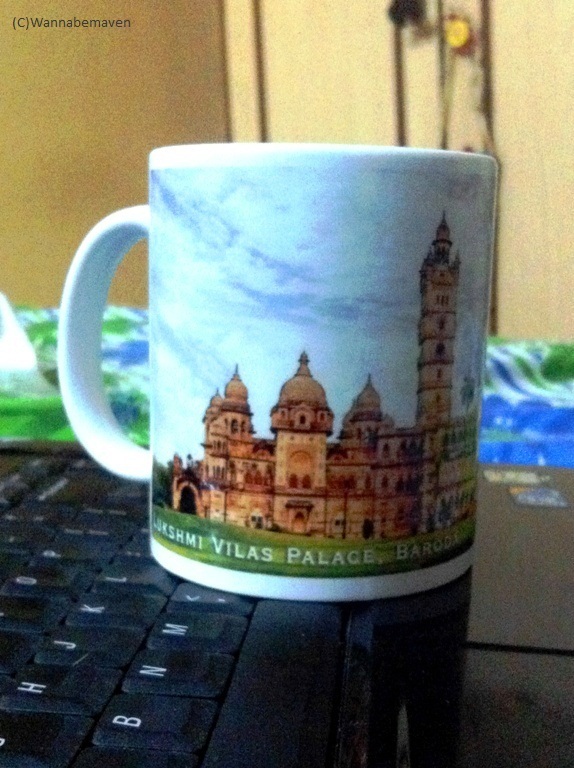 There is a souvenir shop inside the palace and we very excitedly bought home a Laxmi Vilas Palace mug as a memorabilia. Entry to the palace is open on all days except Monday between 9:30 am and 5 pm. Entrance ticket to Laxmi Vilas Palace is Rs. 150 per adult. The ticket cost includes an interactive audio guide that makes the money worth it. Visitor vehicles are allowed inside the palace premises and there is parking space allotted. Photography is allowed only from the outside. No photos can be taken inside the palace. Check out the Fatehsingh museum within a few meters from the Laxmi Vilas Palace. The Fatehsingh museum boasts of exquisite oil paintings of artist Raja Ravi Varma and very elegant looking sculptures and busts. Subscribe to this blog to receive my monthly newsletter in your inbox. Architecture, Castles and Palaces, Heritage, Road Trip, Sightseeing, Tourist attraction, Travel, Vadodara. Bookmark.